Part 1 New product development head-on: Trends, processes and perspectives: Consumer-oriented innovation in the food and personal care products sectors: Understanding consumers and using their insights in the innovation process; Changes in food retailing and their implications for new product development; Recent advances in commercial concept research for product development; Innovation strategies and trends in the global fast moving consumer goods sector: An interview with Mintel’s Jo Pye; Innovation in foods and personal care products: An interview with Gail Civille; Innovation in sensory practice and education: An interview with Howard Schutz. Part 2 Hedonic scaling in new product development: Past, present and future: Hedonic measurement for product development: New methods for direct and indirect scaling; The effects of context on liking: implications for hedonic measurements in new product development; Going beyond liking: Measuring emotional and conceptual profiles to make better new products. Part 3 Consumer research methods in new product development: Consumer understanding and reaction to health claims: Insights and methodology; Pricing for new product development; Experimental auction markets for studying consumer preferences; Doing consumer research in the field; The importance of consumer involvement and implications for new product development. Part 4 Statistics and new product development: Statistical design of experiments in the 21st Century and implications for consumer product testing; Data handling in cross-cultural studies: Measurement invariance; Bayesian networks for food science: Theoretical background and potential applications. Part 5 New product development in the future: New consumer trends, new science: Corporate social responsibility – does it matter to consumers? Anti-consumption: A cause for concern in the food and personal care products sectors? Genetic variation in taste and odour perception: An emerging science to guide new product development; Neuroimaging of sensory perception and hedonic reward; Molecular gastronomy, chefs and food innovation: An interview with Michael Frøst. Experts from around the world present changes in the global marketplace and developments in research methodologies underpinning new product development (NPD) in this essential collection. The business and marketing aspects of NPD, sometimes neglected in books of this type, are addressed alongside methods for product testing. 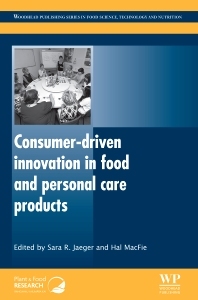 Trends, processes and perspectives in consumer-driven NPD in the food and personal care product industries are addressed in the opening chapters of the book. Specific topics include evolution in food retailing and advances in concept research. Hedonic testing is the focus of the next section. Different viewpoints on consumer research methods and statistics for NPD are reviewed in later chapters. The final part of the book looks towards the future of innovation, covering the implications for NPD of topics such as human genetic variation in taste perception and neuroimaging. Several chapters are not standard scientific articles. Rather they are written records of conversations between two people on a particular topic related to consumer-driven innovation in foods and personal care products. In them the interviewees speak freely about their views and experiences in NPD, providing unique insights. Consumer-driven innovation in food and personal care products will broaden readers’ understanding of the many approaches available to NPD personnel and ways in which they can be used to support innovation activities. Dr Sara Jaeger is the leader of the sensory and consumer science team at the New Zealand Institute for Plant and Food Research. She is experienced in sensory science and marketing, and is a prolific author including many papers providing a unique multi disciplinary perspective in consumer science. Widely in demand as a scientific reviewer and research collaborator, and with a growing reputation as an innovative consultant, she continues to explore and develop new research methodologies to assist the food, beverage and personal care industries. Dr Hal MacFie is an independent food consultant, visiting Professor at the University of Reading and editor of the journal Food Quality and Preference. He is widely respected for his work in sensory and consumer science.